Let's bridge the gap between strategy design and delivery! These principles are for us both a moral rule and a basic truth. 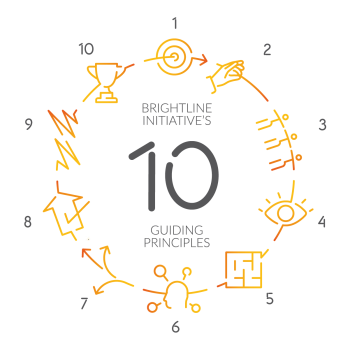 They were developed by group of experts, practitioners, and researchers, supported by the Brightline team. Strategy delivery doesn’t just happen automatically once it is designed! The importance of active and visible leadership cannot be overstated. You invest substantial resources, creative time, and energy in designing the right strategy. You need to give equal priority and attention to delivering it — before you move on to something else. It’s an essential part of your role to ensure that your organization has the program delivery capability it needs to implement your strategy. The orchestration required to succeed in today’s fast-changing and complex business environment is enormous. Once you have defined and clearly communicated the strategy, your responsibility shifts to overseeing the progress of implementation so that the strategy delivers results and achieves its goals. You need to know where in your organization change happens and who manages the programs that drive that change. You are accountable for proactively addressing emerging gaps and challenges that may impact delivery. Without this discipline, rigor, and care, your strategy has little chance of success. Inspire and assign the right people to get the job done! Actively balance “running the business” and “changing the business” by selecting and securing the right resources for each — they often have different needs. Recognize that team leadership skills are at a premium, and assign the best leaders with sufficient capacity to tackle head-on the most challenging programs and those essential for successful strategy implementation. Don’t forget to look outside! Continue to monitor customer needs, collect competitor insight, and monitor the market landscape for major risks, unknowns, and dependencies. Advantage in the market flows to those who excel at gaining new insights from an ever-changing business environment and quickly responding with the right decisions and adjustments to both strategy design and delivery. Initiating or rapidly reacting to dramatic changes in the business environment is an increasingly important capability for success. Many of the delivery challenges you will face will be complex and interdependent. In the face of this, the best way to remain nimble is to surround yourself with simplifiers rather than complicators. You need people who can get to the core of an opportunity or threat, understand the drivers, deliver the information, and take the action you need in the way you need it. That way, you minimize bureaucracy, explore ideas, take appropriate risks, prioritize work, ensure accountability, and focus on delivering value through your strategic initiatives. Gain genuine buy-in from middle and line managers by engaging and activating them as strategy champions rather than just as managers and supervisors. Don’t just assume your people will “get it” — leadership must firmly establish a shared commitment to strategy-delivery priorities and regularly reinforce it. This isn’t the time or place for subtlety. Govern through transparency to engender trust and enhance cross-business cooperation in delivery. Follow your decisions through to delivery! Commit to making strategic decisions rapidly. Move quickly to correct course, reprioritize, and remove roadblocks. Accept that you likely won’t have all the information you want, and rely on those you can trust to deliver sufficient reliable input to allow thoughtful decisions. Consider and address risks and interdependencies explicitly — both upfront and regularly throughout delivery. Build a lean and powerful governance structure to reinforce accountability, ownership, and a bias towards action, based on agreed metrics and milestones. Resist the temptation to declare victory too soon! With the right governance, leadership, rigor, and reporting capabilities in place, you can regularly evaluate your portfolio of strategic initiatives. Add new initiatives in response to new opportunities, but first be sure you understand both the existing portfolio and your organization’s capacity to deliver change. Actively address any issues you discover. In the long term, strategic initiative management discipline — critical for effective orchestration of a dynamic initiative portfolio — will work only if robust assessment, support, and course correction are in place. Proper planning and preparation prevent poor performance! The old axiom is as true as it ever was, but in today´s business environment, strategy planning cycles must be more rapid, dynamic, and agile than in the past. Empower program delivery teams to experiment and learn in an environment where it is safe to fail fast. Discuss challenges openly, and adjust the plan as needed for success. Learn to reward failure, or at least accept it as valuable input. Inspiring people is part of your job! Yes, you have to drive accountability and focus on delivery, but you also need to motivate those who do the work. Actively shape a winning culture by engaging and exciting the people responsible for delivering strategic change programs. Celebrate successes and quick wins. Generously and publicly acknowledge those who demonstrate the leadership behaviors and program delivery capabilities that make strategy succeed, and ask them to share their experiences.